I love peaches and the season is still going strong here. 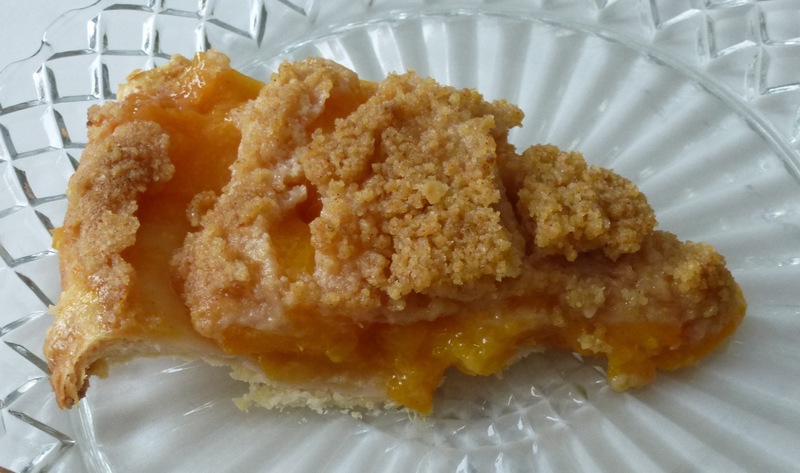 I have had a craving for fresh peach crumb pie, like the ones we saw at the farm stands in New Jersey when I was growing up. This is my own recipe and the house smells wonderful while it is baking, with not only the aroma of peaches but also nutmeg and almond. 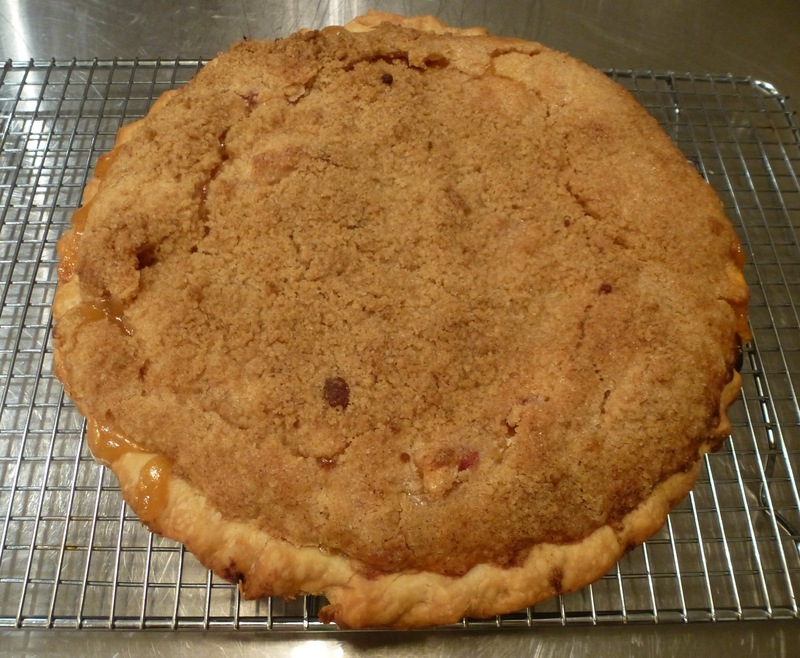 The crumb topping comes out of the oven nice and crunchy, as it sits the crumbs become softer. Preheat oven to 375 degrees. In a bowl combine flours and salt. Mix. Cut lard into flour and with your hands form pea-size crumbs. Make a well in the center and add just under 1/2 c. ice water. Gently and carefully work the dough into a ball with your hands. Just bring dough together; do not overwork because you want to see lard marbling the dough as you roll it out on a lightly floured surface (roughly 1/8″ thick). Fit dough into the bottom of a 9-inch pie plate. (You will have enough pie dough for a second pie or save for another use.) Add peach filling and trim the edges. Sprinkle the crumb mixture onto the peach filling. Bake for 45-50 minutes until filling is bubbling up from the crumb mixture. Cool on rack. Store covered at room temperature. Serves 8. In a bowl combine peaches and sugar. Stir to mix. Add flour and stir again. Add nutmeg, flavorings, and salt. Mix to dissolve sugar. Pour into prepared pie crust. In a bowl combine flour, sugars, spices, and baking powder. Stir well to mix. Cut butter into the flour mixture. Sift it with your hands to make crumbs, then sprinkle the crumbs over the peach filling. Note: Here is a nice alternative Ginger Lime crumb topping that complements the peaches well. It is adapted from Bake From Scratch Magazine. Mix together 3/4 cup flour, 1/2 cup granulated sugar, 2 teaspoons lime zest, 1/2 teaspoon kosher salt, 1/2 teaspoon ground ginger, 1/4 teaspoon ground cinnamon, 1/3 cup unsalted butter, melted. This entry was posted in Dairy-free, Desserts, Fruit, Pies. Bookmark the permalink.